Matt C: Saga reaches its 50th issue this week, which is an impressive milestone for any indie comic book, although it's not really surprising that the combined talents of Brian K. Vaughan and Fiona Staples could reach this stage and show no signs of running out of ideas. It may not always get the attention it perhaps deserves around these parts but it remains an inventive, thoughtful delight, a space opera strictly for adults, one that surprises in both its daring nature and the way it captures genuine, relatable humanity within its pages (albeit, humanity with wings and horns). 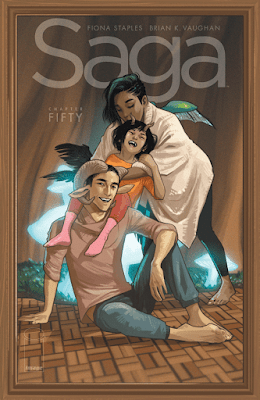 Sixty issues is often the stopping point for series in this vein, but there's enough going on to indicate Saga may go further. I'll be there until the end, either way. Days Of Hate is the other highlight from Image Comics, a searingly powerful look at a possible very-near-future that rings true on a frightening number of levels. The delayed fourth issue of Doomsday Clock arrives on Wednesday (with further delays expected for subsequent instalments), but each chapter so far has unspooled the controversial tale in engrossing and unexpected ways. I'm genuinely excited to see where Geoff Johns and Gary Frank take the story next. Over at Marvel, Brian Michael Bendis and Michael Gaydos say farewell to their joint creation in Jessica Jones #18, with Bendis now firmly ensconced with the Direct Competition. It hasn't hit the heights of Alias - the writer has played the 'decompression' card a bit too often - but overall it's proven to be a welcome return with some smart, mature themes being woven into the texture of the Marvel Universe once more. Andy H: It's the final week of March so what goodies will find their way onto my pull-list to see the month out? Off the bat we've got the excellent Peter Parker: The Spectacular Spider-Man #302. I love some time travel shenanigans and Chip Zdarsky delivers! Last time, time-displaced Spidey met past Spidey and of course J. Jonah Jameson came along for the ride (Two JJJ's meeting up! Who knows what will happen next?!). All jolly good fun. The 'epic' 16-part 'No Surrender' storyline continues in Avengers #686: plenty of action to keep everyone happy but the highlight has to be the return of the Hulk. Wonder Man has his work cut out if he wants to stop the green behemoth. While I'm not reading Doctor Strange: Damnation, I'm sorely tempted by the Damnation: Johnny Blaze - Ghost Rider one-shot. I've no idea what the story involves but Johnny Blaze is my favourite Ghost Rider and the art is by Phil Noto, a winning combination in my world. Moving away from Marvel it's off to Image and Manifest Destiny #34. This is one of those books that I always look forward to, as the world created by Chris Dingess has had me hooked from issue #1. This is an alternate history, with monsters and beasties that make a totally riveting read. Finally, Doomsday Clock #4 is here. Looks like the title may not be hitting the monthly schedule we hoped for but the Geoff Johns/Gary Frank combination will always make it worth the wait.